Tadashi Endo – Butoh-dancer, choreographer, director of the Butoh-Centre MAMU and artistic director of the Butoh-Festivals MAMU Butoh & Jazz in Göttingen embodies in the truest sense of that word the wisdom of both, the Western and Oriental dance and theatre traditions. After his study as a thea.tre director at the famous Max-Rein.hardt-Seminar in Vienna, he performed in collaboration with jazz musicians. In 1989 he met Kazuo Ohno who already then realized a deep relationship between Endo‘s dance and the Butoh-dance. Since then Tadashi Endo developped his movements to that ethetic and expressive dance, as you can see today. His dance is like a synthesis of theatre, performance and dance, Tadashi Endo succeeds to express the field of tension between ying and yang, male and female and their everlasting alteration. 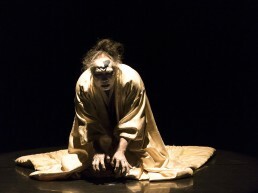 He is the master of being „in between“, that is Butoh – MA. „Tadashi Endo’s dance reaches beyond the mundane, head-lead conventions of much that calls itself theatre, and instead goes right to its pure essence, straight to the heart. A true genius and master of his craft, coupled with a humility rarely found in this ego fuelled age, Endo had me by the spiritual balls from the start. 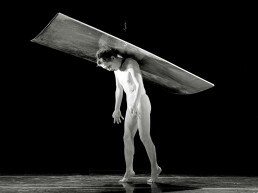 His Butoh – MA explores that elusive gap between emptiness and form… form and emptiness. He manages to fill that void with a poetic beauty, precision movement and spiritual flavour. It`s like cut grass and cut glass, one smells good and brings back memory, the other cuts into you leaving a scar. If you want to have a very different experience in dance or movement or in your life, you should join a butoh workshop with TADASHI ENDO! TADASHI ENDO’s workshops are very popular and always sold out. Participants are coming from all over the world to learn from him about butoh dance and butoh philosopy. TADASHI ENDO is a very unique and wonderful teacher. 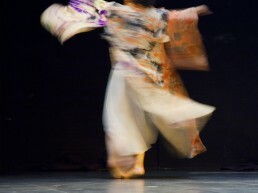 “Everybody can dance butoh – may be not the Japanese butoh, but everybody can find his/her own butoh” . These words from Kazuo Ohno give a most important influence in Tadashi Endo’s teaching. butoh Centrum MAMU just got 25 years! On July 24 the rehearsal for the dance project HA DÔ will start with about 20-25 dancers.